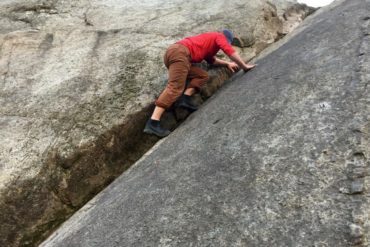 The lower Slocan Bluffs in Slocan City have seen some development recently thanks to the efforts of valley resident Daren Tremaine. The lower Slocan Bluffs in Slocan City have seen some development recently thanks to the efforts of valley resident Daren Tremaine with some help from Jason Hartley and Albertan Marcus Norman. 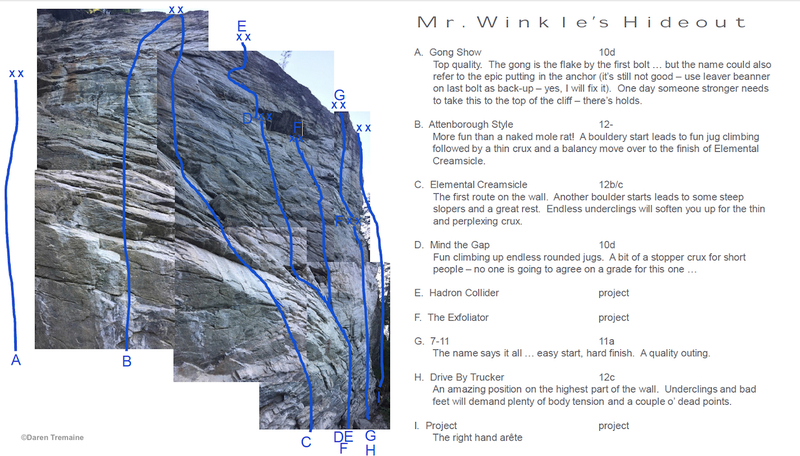 The 30-metre-high cliff, called Mr. Winkle’s Hideout, boasts a stunning white face that kicks back at mid-height and offers some fantastic upper-grade climbing. 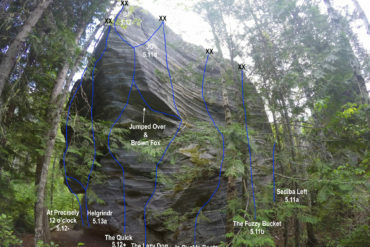 The fact that no-one had developed the crag before last year is surprising given that it’s located just down the old rail trail from the path that leads to the popular “Under the Big Top” route. It is set back behind tall trees, however, and hard to spot from the trail so most people miss it as they walk towards the tunnel. 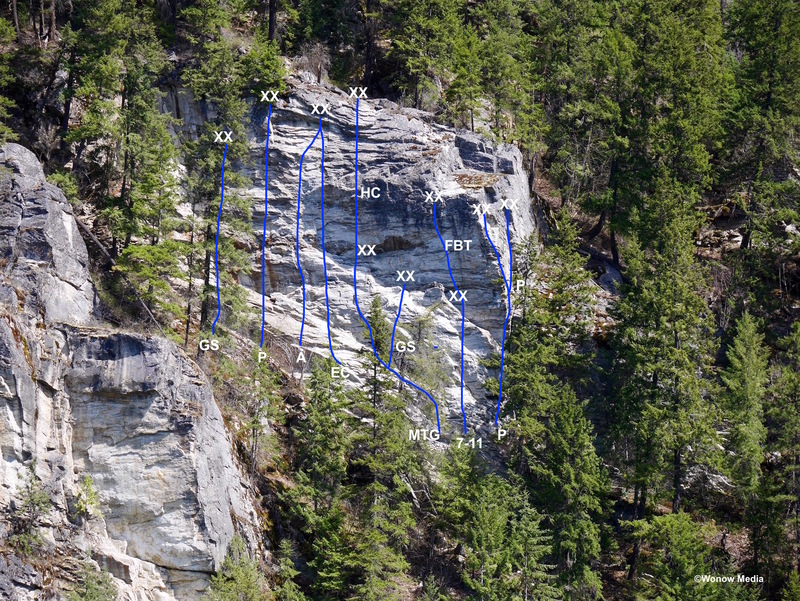 To access the wall, follow the directions for the Slocan Bluffs on page 121 of the West Kootenay Rock Guide. Walk the rail trail past the first walls and the recently upgraded trail leading to Under the Big Top. Continue on the rail trail and 10 metres past Pyramid Rock is a faint trail on your right. This trail requires some maintenance but it switchbacks up and to looker’s left until it reaches the base of the wall. The first completed climb you come to is “Drive By Trucker.” All routes are sport and require a 60-metre rope. The projects here are still closed as Daren will continue to work on them this summer. 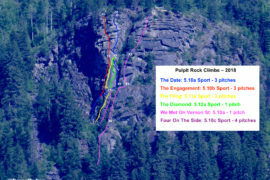 Members of TAWKROC and Wonow Media have not had a chance to get on these routes yet, so the following descriptions are from Daren. 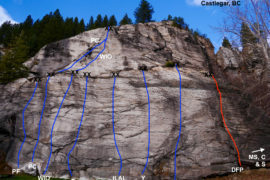 Routes listed from left to right. Note: A stick-clip is recommended as the first bolts are high. Also, be cautious of kicking off rocks as they have a tendency to careen down to the rail trail where hikers and dog walkers also travel. There’s now a closed project between Gong Show and Attenborough Style. E. Hadron Collider A closed project that is a continuation past the anchors for Mind the Gap. I. 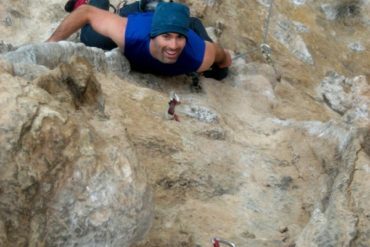 Project The right-hand arete. There’s another closed project that’s just started to be developed a bit further right of the arete. 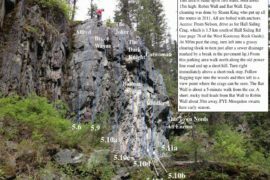 For more written descriptions and updates of other areas in the West Kootenays, download the West Kootenay Rock Guide updates.